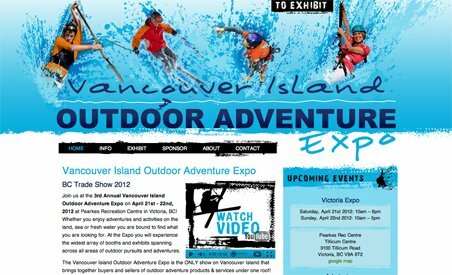 The annual Vancouver Island Outdoor Adventure Expo is a one-of-a-kind trade show that brings together buyers and sellers of outdoor adventure products and services. Whether you’re an outdoor enthusiast who’s passionate about land, sea, or freshwater adventure, the Expo will satisfy your craving. The Expo has a wide variety of booths and exhibits, as well as unique opportunities to experience the outdoor culture. Take a ride on the 130 foot zip line, learn how a surfboard is shaped or learn how to properly carry a kayak. The annual Vancouver Island Outdoor Adventure Expo is a one-of-a-kind trade show that brings together buyers and sellers of outdoor adventure products and services. Whether you’re an outdoor enthusiast who’s passionate about land, sea, or freshwater adventure, the Expo will satisfy your craving. The Expo has a wide variety of booths and exhibits, as well as unique opportunities to experience the outdoor culture. Take a ride on the 130 foot zip line, learn how a surfboard is shaped or learn how to properly carry a kayak. The Vancouver Island Outdoor Adventure Expo is a chance to meet the dedicated industry professionals and to find out all that beautiful Vancouver Island has to offer.